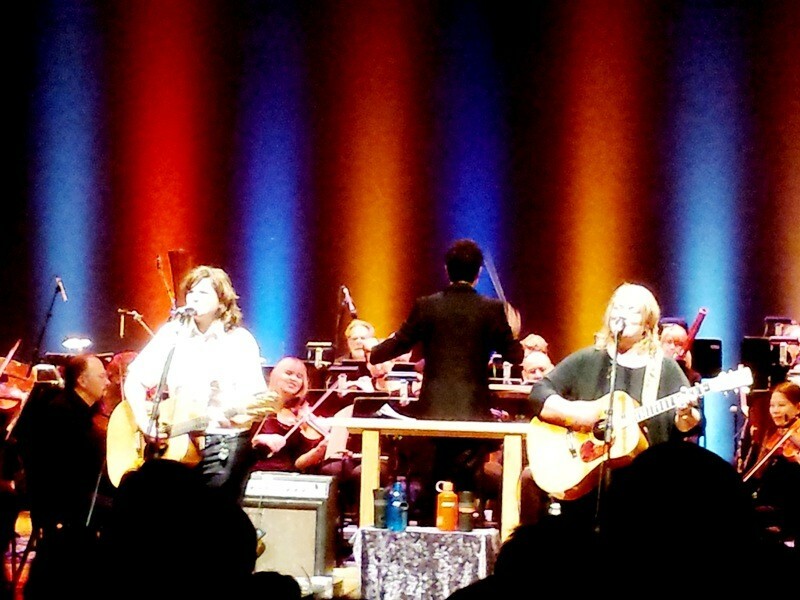 Indigo Girls' Amy Ray (left) and Emily Saliers melded well with the Spokane Symphony during their 17-song set. The pairing of pop musicians with a symphony orchestra can be a dicey thing, potentially leaving fans of the guest artist and the symphony both unsatisfied with the results. It's doubtful that will be the case for anyone who saw the Indigo Girls join forces with the Spokane Symphony Saturday night for a memorable couple hours at the Martin Woldson Theater at The Fox. For Indigo Girls fans — and there were plenty, judging by the non-stop shouted requests and impromptu dancing dotting both sets — hearing 17 songs evolve from their folk-pop roots into lushly orchestrated epics was a treat. For symphony regulars, hearing the local musicians conducted by Jorge Luis UzcÃ¡tegui tackle something beyond classical music must have made for a distinctly different night at the symphony. And judging by the looks on the faces of many the symphony musicians themselves, they were having as much fun as the audience and featured headliners. The Indigo Girls' Amy Ray and Emily Saliers are total pros, capable of delivering an excellent show in virtually any environment, so it's no surprise the orchestrated versions of their catalog worked well. Possibly surprising to them, judging by their ecstatic response to the Spokane Symphony's efforts behind them on stage, was how well the songs would come across on this visit to Eastern Washington, the only symphony performance of their fall tour. The duo repeatedly gave the musicians love in their between-song banter, and Saliers called it the "best symphony show" she could remember. The audience was just as engaged, giving the Girls a standing ovation before they played a single song, and several more after. In many ways, the show resembled a typical Indigo Girls set, in terms of the mix of old favorites and newer songs, and tunes punctuated with Ray or Saliers exclaiming "Thanks, y'all!" Every song came with the Girls' swapping out acoustic guitars for electrics or mandolins or more acoustic guitars. All familiar activities for folks who have seen the duo over their three-plus decades on the road. But the orchestra definitely brought a welcome new feel to several songs. Ray's "Compromise" was brilliant and dramatic in its new iteration. The xylophone (maybe marimba?) that opened "Galileo" was a nice touch, as was the solo violin at the beginning of Saliers' "The Wood Song." Old favorite "Chickenman" was a treat, as the symphony members rocked out to keep up with Ray's stomping tune, and Saliers' "Ghost" was truly transporting for the audience, as she said it was for her when we chatted last week. 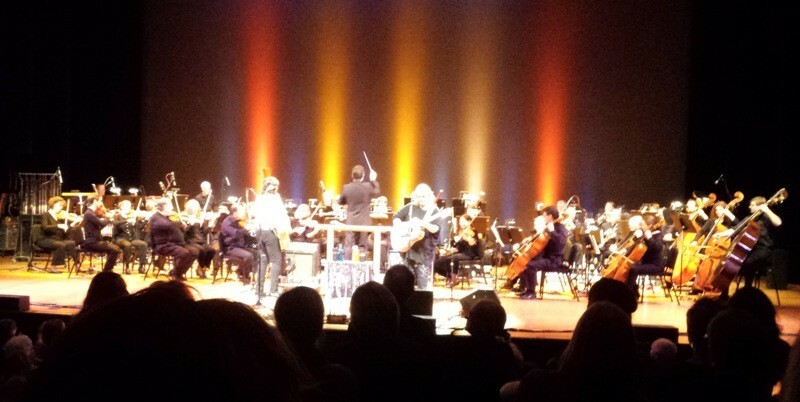 All in all, it was both an excellent Indigo Girls performance and fun night at the symphony, and an altogether different type of show for both. As Saliers' said in introducing "Power of Two" and welcoming people to sing along, "I was going to say 'don't be afraid because it's a symphony show,' but I can tell you're not." Nope, the audience embraced this special combination just fine. People on their feet and dancing—not a typical scene at the Spokane Symphony.